A Summary of the National and International Responses Vol. IV. Citation: Leckie, L., Cunliffe, E., and Varoutsikos, B. 2017. Towards a Protection of the Syrian Cultural Heritage: A Summary of the National and International Responses Vol. IV (October 2015 – December 2016). Heritage for Peace: Girona. The report is freely available to download here. Read the press release with links to previous reports here. The Tetrapylon in Palmyra. Photo source DGAM. A video of the damage, by RT Arabic, is available here. Less damage to ancient Palmyra than feared, Syrian antiquities chief says. The DGAM statement is available here, and Reuters have also covered the situation here. The DGAM have posted photographs of the Tomb of the Three Brothers here. The Guardian offered an overview of Palmyra and the area around it, available here. UNESCO have called for renewed efforts to protect the Syrian heritage after the liberation of Palmyra, available here. 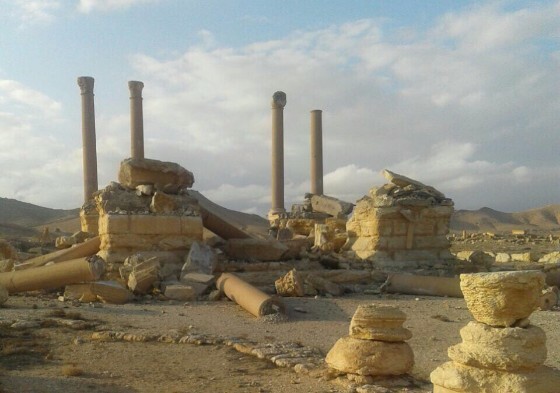 The Authority of Tourism and Protection of Antiquities in Al Jazira Canton – Syria published a report about some materials discovered in Tell Mozan as a result of weather here. Aleppo Archaeology shared photos showing the damage to Dar Ghazala in the old city of Aleppo, available here and to Alatawi Mosque available here. The DGAM shared photos of Abbais Mosque, Al Sakakini Mosque and Al Tawbah Mosque in Old Aleppo here. Photos of Dar Janpolad, Beit Junblatt are available here. The Washington Post offers a very personal insight into heritage loss in Aleppo here. The DGAM have published photos on damage to Bakirha, part of the World Heritage Ancient Villages of Northern Syria, which has experienced looting, available here. Sam Hardy has published a freely available quantitative analysis of open-source data on metal detecting – “the scale and intensity of metal detecting and the quantity of metal-detected cultural goods”, available here. Through netnographic analysis of online forums and social networks, this study presents quantitative analysis of the scale and intensity of metal detecting and the quantity of metal-detected cultural goods. It adapts open-source data to develop empirical measures; to ensure reliability and consistency of sourcing and interpretation, these data were drawn from English-language forums and networks. Based on a poll of 668 online community members, it infers the size of active detecting communities from the size (93.42%) of online detecting communities. Based on open-source data on the detecting practices of 101 detectorists, the worst tolerable weather for 151 detectorists and seasonal variations in the reporting of 1,089,337 finds to the Portable Antiquities Scheme over 13 years, it determines a pragmatic minimum average of 286.02 h of detecting per person per year. Comparing activity in a wide range of permissive, restrictive and prohibitive regulatory environments – based on local-language forums and networks in Australia, Austria, Flanders and elsewhere in Belgium, Canada, Denmark, England and Wales, Ireland, the Netherlands, New Zealand, Northern Ireland, Scotland, and the United States – it finds that permissive regulation is ineffective in minimising harm to heritage assets, whether in the form of licit misbehaviour or criminal damage. Restrictive and prohibitive regulation appear to be more effective, insofar as there is less overall loss of archaeological evidence. according to Agenzia Fides here. Young artists, activists, professionals, academia and experts, and local authorities from Algeria, Bosnia Herzegovina, Egypt, France, Germany, Jordan, Lebanon, Morocco, Mauritania, Palestine, Switzerland and Syria, gathered at the regional conference “Cultural heritage and identity: an Arab youth perspective” organized by UNESCO in Tunis-Carthage, from 1 to 3 March 2017. One major question on the agenda: In a region where conflict and violence are pushing communities and societies to the edge, how are young people using the power of culture and arts to resist, preserve and rebuild their society and its diverse identities? Read more on the UNESCO website here. On 10 March an International Alliance for the Protection of Heritage in Conflict Areas (ALIPH) was established. Its objectives are to create a $ 100 million fund and an international network of “shelters” to shelter threatened cultural property. The creation of this Geneva-based fund was decided at an international conference in Abu Dhabi in December. France and the United Arab Emirates under the patronage of Unesco had organized this meeting, which was attended by representatives of about forty countries, including Switzerland. “The next step will be the donors’ conference to be held on March 20 at the Louvre Museum in Paris,” said Jack Lang, former French Minister of Culture and current president of the Institut du monde arabe in Paris. No figures were mentioned at the end of the conference, but France and the United Arab Emirates had mentioned a target of 100 million dollars. French President François Hollande announced a French contribution of $ 30 million. Other states, including some Gulf monarchies and China, said they were prepared to make a financial effort, without specifying amounts. Article via Google Translate from the French original in Tribune de Genéve, here. The Exzellenzcluster Topoi and the Berlin Graduate School of Ancient Studies (BerGSAS) with funding of the Einstein Doctoral Programme are offering 21 doctoral fellowships at Freie Universität Berlin and Humboldt-Universität zu Berlin, starting 01.09.2017 or 01.11.2017. The fellowship is fully associated with the admission to one of the five doctoral programs of the BerGSAS. A structured curriculum forms the base of every doctoral program. UNESCO hosted the First International Coordination Meeting for the recovery of Aleppo’s heritage. They brought together Syrian stakeholders and international experts to evaluate damage to historic monuments including the citadel, madrasa al-sultaniya, grand serail, and souk of the Ancient City of Aleppo, a World Heritage site, and to strategize Aleppo’s recovery during a Technical and Coordination Meeting convened by UNESCO in Beirut, Lebanon from 2-3 March, 2017. Read more on their website here. A report on the meeting from the DGAM is available here. New Report by Camilo Montoya-Guevara for the Aleppo Project: Aleppo’s Al-Madina Souq: Post-Conflict Reconstruction Of Its Social Functions. A summary of the report and the full report are available here. FUNCI is an NGO that works to highlight the role of culture in facilitating the understanding between Muslim-majority countries and Western countries, promoting tolerance and intercultural harmony. Their website is here. The Oxford Archaeology Image Database is making photographs of Middle Eastern sites available online. See their website here. Popular Archaeology reports on Cultures in the Crossfire: Stories from Syria and Iraq, a new special exhibition at the Penn Museum, due to open April 8th. See here. Hyperallergic offers an interesting criticism of the new Getty Exhibition on Palmyra, arguing it has fallen into Orientalist traps, here. University of Central Florida writes about the work done by ASOR CHI, profiling Scott Branting, to protect heritage in Syria and Iraq – As War Rages, Archaeologist Uses Satellites to Protect Ancient Sites in Syria, Iraq (available here). The Louvre has offered to serve as a safe haven for objects, but the proposal is controversial, writes the New York Times here. Syrian Culture Minister Mohammad al-Ahmad affirmed the importance of the liberation of Palmyra from ISIS terrorists in SANA, here.